Groups that want to open mainstream, special and alternative provision free schools in September 2013 can submit their detailed plans to the Department from today. They will follow in the footsteps of the first 24 Free Schools, which opened in 2011 in record time. A further 72 Free Schools are in the pipeline to open in September 2012 and beyond. The Bilingual Primary School for Brighton and Hove, which plans to teach in English for 50 per cent of the time, and Spanish for the other 50 per cent of the time. The London Academy of Excellence, which will be a brand new sixth form Free School. It is being set up by Brighton College - a highly successful independent school - with other independent schools. It is aimed at pupils from disadvantaged areas. Everton in the Community Free School, Liverpool, which is being set up by Everton Football Club to provide an education for vulnerable young people who can’t attend mainstream schools for a number of reasons. Lighthouse School, Leeds, which is being set up by a group of parents to provide children with a diagnosis of Autistic Spectrum Disorder with a well-rounded education. Tauheedul Islam Boys’ High School, Blackburn. The girls’ school run by the proposers has the best track record in the country in ensuring that pupils with low prior achievement at primary school achieve five or more good grades at GCSE. Seventeen University Technical Colleges and 12 Studio Schools are also aiming to open from 2012 onwards. Free Schools are part of the Government’s drive to raise standards in education, to improve choice for parents, and to make sure the system responds to demands from local communities. Like Academies, they have greater freedom for teachers than local authority schools, including more choice over the curriculum, how money is spent and the length of the school day. The majority of the first Free Schools are in disadvantaged areas or where there is a shortage of school places. Even before they opened, 15 of the first 24 schools were oversubscribed for their first year, with some seeing more than three applications for one school place. For 2012, The West London Free School has received more than 1000 applications for 120 places. When we opened the first round of applications for Free Schools, there was plenty of scepticism. Would anyone really want to open a new school? Would busy parents and teachers find the time to do it? The answer to these questions was a resounding yes. I am therefore delighted to invite more talented groups to submit their plans to open Free Schools and Studio Schools in September 2013. They will play an important role in raising education standards in our communities, creating choice for parents, and responding to local need. The Free School Norwich is open for 51 weeks of the year. It operates a six term year and provides a low-cost, high-quality extended school service which is open throughout term time and the school holidays to help support working parents. It is closed for just one week at Christmas. Langley Hall Primary Academy has professional performance artists and musicians to teach high-quality drama, dance and music. Groups wishing to open Studio Schools from 2013 can also submit their applications. 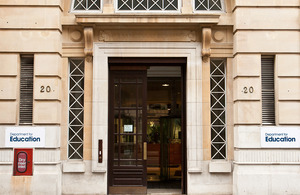 Twelve have already been approved to open in 2012 - with the backing of employers like Glaxo, Sony, the BBC and Fulham FC. They join six Studio Schools that are already open. Studio Schools offer academic and vocational qualifications, but teach them in a practical and project-based way. Study is combined with paid work placements with local and national employers who are involved in the school. Learning in this way encourages students to develop skills like punctuality, good communication, reliability and team working, whilst gaining a strong grounding in English, maths and science. robust financial plans, and how the school will provide value for money. After a competitive selection process, shortlisted groups are then invited to an interview. More information about Free Schools and Studio Schools, including how to apply, can be found on the Free School pages of the Department for Education website.